Mag wheels are crucial in the overall look and performance of any vehicle. Superior quality alloy wheels or mag rims can mean a smooth-sailing drive each and every time. Unfortunately, just like the rest of a vehicle’s parts, mag wheels are also susceptible to damage when one accidentally brushes against a curb or dips into a pothole. It can be disheartening to look at damaged alloy wheels and mag wheels. Of course, the first thing that you may think is to wait until those mag wheels fall apart. It is true that a set of mag wheels can be very expensive to replace, but mag repairs in general are cheap. The key to getting the most bang for the buck is to find a reputable alloy wheel repairs shop that can fix your problems fast, cheap, and the most efficient manner possible. Here are top three of the most common mag issues that motorists encounter. These mag wheels problems should be fixed immediately to avoid bigger problems as well as prevent accidents from happening. Curb damage to mag wheels usually happen during the colder months due to the formation of ice, snow, and freezing rain. The development of ice layers on the streets is a driving hazard. More often the slippery driving conditions results in the wheels slipping on these ice-cold layers lading to accidentally hitting a curb or two. Hitting a crub can result in damage not only to the rim finish but also to the wheel itself. If you don’t have the basic tools to handle a damaged alloy wheel or mag wheel at home, you need to drive your car to a reliable mag rims repair shop to get things straightened out in a fast and efficient manner. An auto shop specializing in mag repairs will employ several techniques to remedy the issue; from heating to softening up the alloy or aluminum mags to effectively repair damages. Besides the use of specialty machines, mag wheel repair shops also polish the rims and coat them with clear paint for that almost new finish. 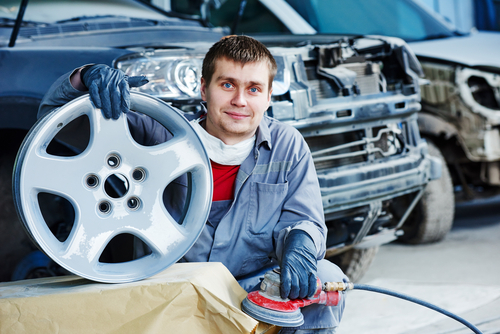 Obtaining mag wheel repair services will save you from unnecessary expenses of replacing them with new ones. Alloy wheel repairs are relatively easy and fast, provided you entrust them to specialty shops for mag rims and alloy wheels. If you wish to enquire about our services or if you have other enquiries, do not hesitate to call us on 0421 136 101 today.